Internal bore gauges are devices for Difference measurement, primarily for the internal dimension of bore diameters. Internal bore gauges can be setup in a way that a wide measuring range can be covered by replacing the fixed measuring anvil. By using a dial indicator according to the DIN standard, principally, measurements with a high level of accuracy are possible. This requires a correct execution of the measurement, which implies an understanding of the construction of the internal bore gauge and that of possible sources of error. The dial bore gauge consists of a gauge head and the device shaft that includes the dial inicator a binding screw, an insulating handle and a gauge head. On the one side of the gauge head is located a movable measuring anvil, which passes the measured displacement over a 90° arc segment on a transmission rod in a device shaft to the dial indicator. Depending on the design of the device, the measuring range covers a span of 1 - 3 mm. On the other side of the gauge head is placed a fixed, replaceable measuring anvil, by which the measuring span is pre-set. Due to this construction, higher measure values indicate a smaller diameter: the smaller the diameter, the deeper the flexible measuring bolt is pressed in. By the fixed measuring anvil the measuring span is pre-set that the measured value is placed as near the centre of the dial gauge as possible. The movable measuring bolt is securely preloaded for the measurement. By means of a difference measurement, the scale of the dial gauge is shifted to 0 or the value of a digital dial gauge is set to 0. The difference measurement may be e.g. a special adjustment tool, a ring gage or a pre-set outside micrometer. 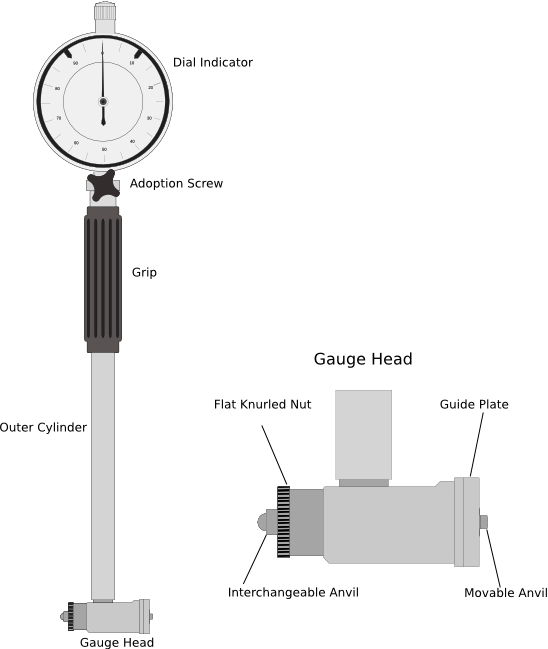 The following instructions for the use of the dial bore gauge apply both to its setting and to the measurement. The gauge head is placed in the centre of the bore, by means of a spring-mounted guide plate. The necessary horizontal alignment of the gauge head is more difficult. If the gauge head is inclined, the bore diameter seems to be larger. 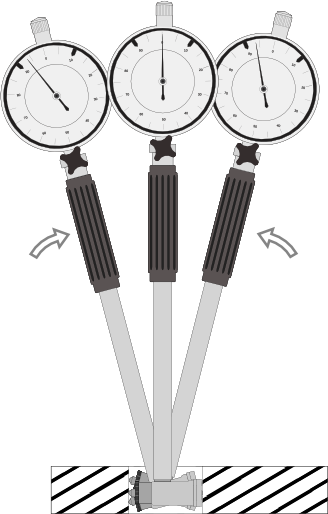 As it is practically impossible to ensure a horozontal alignment of the dial gauge by a manual alignment, the internal bore gauge should be swayed slightly. The more the gauge head is inclined, the smaller is the displayed measured value. The displayed value increases when you turn the internal bore gauge to the horizontal. If the horizontal is crossed, the displayed value decreases again. The highest displayed value, or, in other words, the reversal point of the dial gauge's pointer, is the measured value sought. As mentioned above, higher values indicate a smaller diameter. Consider this when comparing the measured value with the adjusted measure. Positive values are deducted from the adjusted measure, negative values are added. If the internal bore gauge is, for instance, pre-set to 20 mm and measures a deviation of 0.02, then the measured value, ie the diameter, is 20.00 - 0.02 = 19.98 mm.